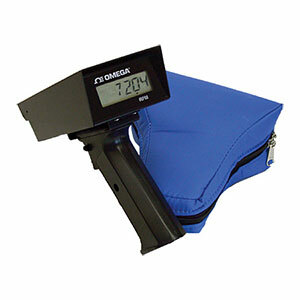 The HHT21A combines the accuracy and safety of a noncontact laser tachometer with the convenience and ease of operation of a pistol grip instrument. Simply aim the tachometer at a reflective tape target on the rotating object, squeeze the trigger, and read the RPM. The HHT21 has both internal laser optics and the ability to be used with a remote optical sensor. It may be handheld or mounted utilizing the ¼-20 threaded bushing in the base of the handle. 참고: The HHT21A comes complete with operator's manual, 4 AA alkaline batteries, nylon case, NIST traceable calibration certificate and 1.5 m (5') of reflective tape. The HHT21A-R-KIT comes complete with operator's manual, 4 NiCad batteries, recharger, rugged case, 1.5 m (5') of reflective tape, and remote optical sensor with mounting bracket and 2.4 m (8') of cable. Add “-230V” to order with 230 Vac recharger; add $10 to price.